Perched on the side of the mountain overlooking the valley, Kayaköy’s “ghost village” attracts visitors from all over the world. The population exchange in the early 1920s saw the original Greek settlers repatriated to their homeland, with the empty homes they left behind offered to Turks sent home in turn from Greece. However, deterred by rumours of poisoned wells – and as they were farmers more used to level plains anyway – few moved in; gradually, over time, the old town was left to decay until an earthquake devastated the area in the 1950s. Timber was in short supply so the local authorities allowed indigenous Turks to take what they could from the empty buildings. Today, just the walls still stand as a testament to a turbulent era described beautifully in the book Birds Without Wings. 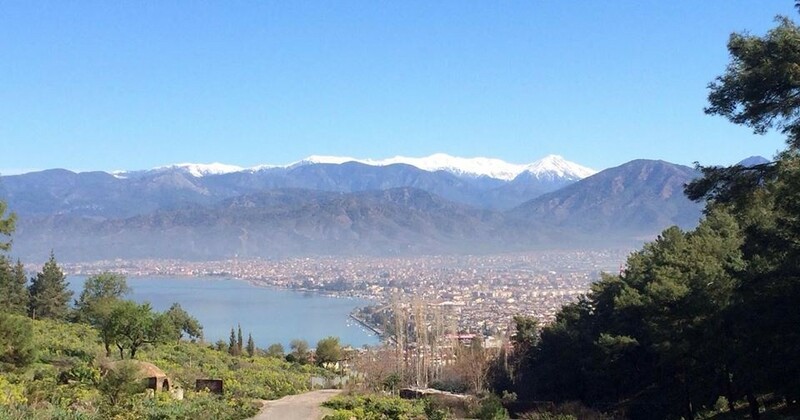 The story has helped to ensure that, every summer, thousands of visitors head for the mountains above Fethiye to see the ruins for themselves. And with tourism booming in Turkey, it’s not surprising that there are now at least two dozen bars and restaurants dotted along Kayaköy’s winding lanes, catering for both tourists who stay in local accommodation and the day-trippers who arrive on quad-bike safaris, on coaches or even on horseback. Most establishments offer “gözleme” – traditional Turkish pancakes – and, of course the famous “kahvaltı”, a generous breakfast of salad, cheese, olives, eggs and spicy Turkish sausage, nuts, dried fruit and honey, often finished off with melon and sweetened tea. After a few months here we already have our own favourite haunts – just as we did back in the UK – and a couple of nights ago we were enjoying a drink with friends in a restaurant where a group of ladies in their 50s had stayed for a week of yoga classes. The 12-strong group was saying its farewells before heading home to the UK and it had been a restrained and refined affair. But then someone swapped the gentle background piano music for a spot of Tom Jones. Perhaps there had been some over-indulgence when it came to pre-dinner cocktails or the sauvignon blanc, or maybe it was simply the balmy Mediterranean evening – but it wasn’t long before there was dancing and, by the time Tony Christie took over with Amarillo, even the waiters were being encouraged to throw a few shapes. To cut a long story short – and to protect the innocent – an hour later we’d all gone through a bit of traditional Turkish dancing, Abba, Adele, some Elvis and the inevitable rendition of Pharrell Williams’s Happy – and there was little sign of anyone wanting to go to bed. The sight of the normally super-efficient maitre-d’ gyrating on the bar and whirling his tie around his head, a normally-reserved and shy member of the waiting staff stripping off his shirt for a particularly energetic Turkish dance and the host’s rendition of Zorba the Greek (a couple of times) are going to be with me for a while. I have no clear recollection of how it happened but I found myself pouring drinks behind the bar so a few more staff could do a bit of dancing and then being left to blearily jab my finger at the sound system to keep the music playing. By all accounts, the next day, all was back to normal; everyone was at work and apparently none the worse for wear. I wish I could say the same but, for me, although one night of spontaneous excess was great fun, it also felt like something of a watershed in our own relocation. We were part of an evening which, for one reason or another, we’ll all remember. This entry was posted in General, Moving abroad and tagged Fethiye, Ghost village, Kayaköy, living in Turkey, Tom Jones, Turkish dancing on September 17, 2014 by theparsleys.